The 88th Kansas Relays were held for the second straight year at the new Rock Chalk Park, a few miles from the University of Kansas campus, in Lawrence, Ks. However, this year all construction at the park was complete and everything usable. Last year the track stadium was usable, but the connected soccer and softball facilities were incomplete as were the final touches on the track facility. While this was the second straight year the meet didn’t feature an invited two to three dozen elite U.S. and international athletes as has been common place the last decade, the high school competition was as good as ever. At least one meet record was broken while many top U.S. high school times and marks were posted in the beautiful new stadium and throws field. 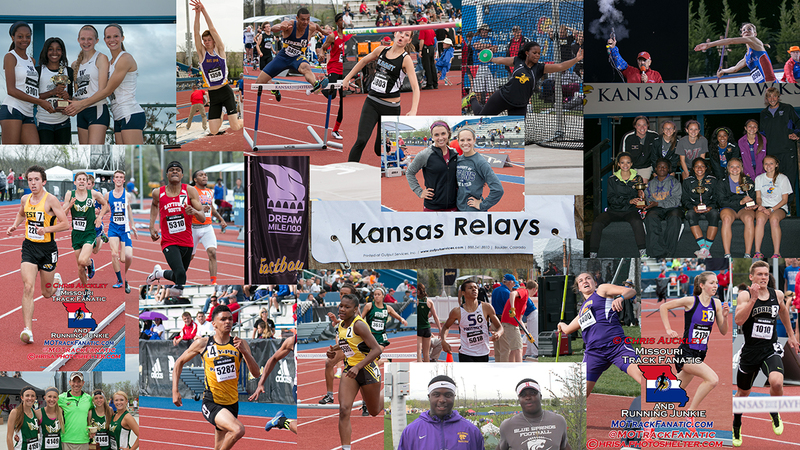 Athletes from high schools in Missouri, Kansas, Illinois, Wisconsin, Iowa, Nebraska, Oklahoma, Arkansas, and Colorado competed. Former Lee’s Summit High School and University of Central Missouri runner and former Lee’s Summit West High assistant coach, Jon Dalby flew in some of his team from Mountain Vista High in Colorado. The Mountain Vista girls distance medley squad rewarded Dalby with a victory and trophy after holding off Olathe East by 34/100ths of a second in 12:24. Coach Jon Dalby with his DMR winning Mountain Vista girls. This year was the first time the meet featured a college quadrangular. Regular college competition went on as usual but a quadrangular meet was contested within the regular Relays with Kansas, Kansas State, Colorado State, and Purdue all competing. It was also at least the fifth year the 100-meter and 1600-meter races were qualifying races for June’s Adidas Grand Prix Dream 100-meter dash and Dream Mile events in New York City. This year the winner of each of those races automatically earned an expenses-paid trip to New York to compete at Icahn Stadium. There is no qualifying standard this year; previously winners had to meet a certain time standard to earn the berth into the Adidas meet. This year’s meet and dream events were and will be sponsored by Adidas and Eastbay. While collegiate competition went on as usual Wednesday and Thursday, news effecting all athletes competing Friday and Saturday came Thursday night. With rainstorms forecasted for Saturday, meet administrators, presumably meet director Milan Donley and assistant Josh Williamson decided to move all Saturday competitions to Friday, cancelling all preliminaries races, redrawing seeds and making sectional finals of all races. This also meant Friday’s track schedule was moved up an hour to start at 8:00 a.m. with the final event was scheduled for 11:50 p.m. That’s 16-hours of track and field in one day! The media was notified by email around 7:50; coaches received an email with the news around 8:30. That left coaches scrambling to change plans from logistics, to scratching events, or altering their individual or relay lineups to give their teams the best opportunity for success with a squeezed schedule and less recovery time in between events. Conditions for Thursday night’s college/open distance races were near perfect with no wind and ideal temperatures. While rain showers were forecasted for Saturday and led to the schedule change, they popped up for a short while Friday, late morning to early afternoon. The rain poured for about fifteen minutes, leaving some fans fleeing for the main concourse and the cover the 2nd and 3rd story press box provided. Temperatures were a little cool while most of the afternoon was overcast, with the sun consistently peeking thru different holes in the cloud coverage. Eureka Sr Hannah Long (left) and Linn-Mar (Iowa) Jr Stephanie Jenks. The meet’s most anticipated event was the girl’s 1600-meters where two of the country’s best squared off in the third and final section. Linn-Mar High School (Iowa) junior Stephanie Jenks faced Eureka senior Hannah Long. The pair are both Foot Locker cross country All-Americans and at last year’s Dream Mile at the Adidas Grand Prix, Jenks finished second in 4:42 while Long was fourth in 4:44. The pair stood in lane one as the starter’s pistol went off and they bolted off the line. Long took the lead around the first curve while Jenks settled in right behind. It stayed that way almost the whole race as the pair clicked off quick splits of 70, 71, and 70 seconds for the first three laps, getting further and further from the rest of the field. Long still had a meter lead on Jenks at the bell lap, but with a 120 meters go, Jenks moved out to lane two and went by Long. Jenks had one more gear than Long and she used it as she pulled away with her arms and legs moving at a higher rate. Jenks broke through the sponsor Eastbay Dream labeled tape, clocking a 4:40.78. A 67.82 last lap gave the Iowa native the top time in the country. Long was able to hold an even pace and finished in 4:43.67. The performance puts Long as the third fastest in the event nationally so far this season. It also appears to be a new Missouri record for the 1600-meters, although Long’s second fastest 1600/mile race. Her full mile time of 4:44.01 2014 Dream Mile time converts to a 4:42.5 for the shorter 1600-meters. Stephanie Jenks wins in 4:40 and secures Dream Mile berth. Hannah Long runs Missouri 1600-meter record 4:43, the US #3 time. Girard (Ks) sophomore Callie Logue and Millard South (Nebraska) senior Katie Spencer made it a total of four to break the sub-5:00 barrier as they both finished in 4:59, while ten girls made it under the 5:10 mark. The boy’s 1600-meters was much deeper than the girls, as it featured a handful of the Midwest’s and U.S.’s best runners, who showed up for their shot at the ticket to the Dream Mile. Gilbert (Iowa) senior and Iowa State commit Thomas Pollard led most of the way. He came through the first lap in 63.19 with the chase pack spreading out a stride back. York (Il) senior Matt Plowman almost caused a crash as he tried to get outside after being boxed in after the first lap. Blue Springs senior standout Stephen Mugeche and a Creighton Prep (Nebraska) runner were able to stay upright while some jostling went on. Pollard continued to lead at 800-meters, coming through in a 64-second split for 2:07 at 800-meters, but now with Plowman right behind him and ten more giving chase. At 1200-meters Gilbert still led with Plowman a stride back, and three more right behind him. With 250-meters to go Bryce Richards (Mundelein HS, Ks) took the lead momentarily after moving out to lane two. However, when Plowman saw Richards move, he made one himself. Plow darted between Pollard and Richards and burst to the lead. Plowman pumped his arms and his legs followed. With 200-meters to go, Plowman had a three-meter lead on Richards when Norman North (OK) high school senior Ben Barrett moved past Richards into second. Plowman came off the turn, moved to lane two and cruised to victory in 4:11.43 to break former Glendale star Spencer Haik’s 2013 meet record of 4:11.76. Barrett was second, a full second back, while Richards was third in 4:13. Blue Springs senior Stephen Mugeche was seventh in 4:15.68. The race’s top seven finished under 4:16, all marks in the top 43 of the MileSplit.com performance list. Plowman’s mark was a US#6 best time in the country and the victory punches his ticket to New York for the Dream Mile. Barret’s mark was a US#9, and Richards clocking was a US#14. York (Elmhurst, IL) Sr Matt Plowman wins the 1600 in 4:11 and a trip to the Adidas Grand Prix for the Dream Mile. Blue Springs Sr Stephen Mugeche takes 7th in 4:15. The open distance races got under way just before noon with the 3200’s. In the girls race it was a duel between Edgewood High (Wi) senior Amy Davis and Katie Spencer of Millard South (Ne). Davis put some distance on Spencer on the sixth lap and cruised to victory in 10:31, a U.S. #24 mark, while Spencer settled for a U.S. #31, 10:35 for second. Francis Howell sophomore standout Maddi Leigh earned a seven second personal record with her third-place 10:55. In fourth-place was St. Teresa’s Academy’s Ann Campbell. The standout senior runner, who just signed to compete in college for Villanova, can’t seem to break the 11-minute barrier. She’s been close with an 11:02 at the state track meet last May, and another 11:02 at the Festus Early Bird meet last month. Her time at the Relays: 11:00.51. Amy Davis of Edgewood, Wisconsin wins in 10:31. Katie Spencer of Millard South (Omaha, Ne) was 2nd in 10:35. The Festus trio of seniors Michael Karls, Tyler Gilliam, and junior Jacob Schweiss made the trip to Kansas with coach Bryant Wright looking for fast times. Gilliam and Schweiss were scheduled for the 3200-meters and 1600-meters while an ill Karls was going to give his best in the 1600. Gilliam moved to the front a few laps in, flanked by Platte County’s Nathan Straubel and Hillsboro’s Aaron Dugan. Gilliam was in the lead on the fourth lap, leading at 1600 in 4:36. A lap or two later Winfield (Ks) junior Riley Olsen moved near the front. The rest of the race the two traded the lead. At the bell, Gilliam had a step or two on Olsen, but Olsen pulled into the lead and held on with a 63-second final lap. Olsen raised his arms in victory, crossing the finish in 9:13. Gilliam was just over a second back in a 15-second personal record of 9:14. Kearney super-sophomore Clayton Adams was sixth in 9:22, while Dugan was eighth in 9:25. Park Hill’s Kyle Pudenz was 11th in 9:28, Schweiss was 12th in 9:33, and Straubel 14th in 9:35. Tyler Gilliam was 2nd in 9:14. Riley Olsen won the 3200 in 9:13. York, Nebraska’s Erin Lee started the girls fastest section of the 800-meters all the way to the outside of the track, but it didn’t seem to bother the junior. At 400-meters, Lee was sixth with a 65-second split; however, the final 400-meters belonged to Lee. Lee’ posted a 67-second final lap to pass the competition and win in 2:12.44 to win by almost a second. Kickapoo’s Allison Bailey was 7th in 2:19, while Winnetonka’s Sabrina Monsees was eighth in 2:19. Erin Lee of York, Ne. won the 800 in 2:12. Park Hill South’s Darrien Case used a different strategy than Lee to win the boys race. The senior, who has committed to UMKC to run for Coach James Butler, was in control the whole way. Case split 55 and 58 to total a 1:53.65, tying the U.S. #34 best time in the country. Runner-up Daylan Quinn, the Liberty (Mountain View) junior and 2014 Class 2 800-meter runner-up and 1600-meter champion, went through 400-meters in 7th place but closed in 58.22, the fastest of the final section, finishing in 1:54.54. Raytown’s Zach Penrod was 5th in 1:56.07. Park Hill South’s Darrien Case won the 800 in US#34 1:53.65. Liberty (Mountain View) Sr Daylan Quinn was 2nd in the 800 in 1:54.54. Lutheran South freshman Riley Schelp continued her excellent year. Schelp took second in the 2000-meter steeplechase at the Relays in 7:32.83, four seconds back of the winner. Nixa senior Marcus Johnson led the second lap of the boys steeple, but couldn’t hold off Dominick Fonseca of Wichita West. Fonseca won in 6:04 while Johnson held on for second in 6:20. Lutheran South Fr Riley Schelp was 2nd in the 2k steeplechase. Nixa Sr Marcus Johnson was 2nd in the 2k steeplechase. All of the high school throwing events were held on the “North Venue”, a throws field about 25-meters from the track’s second curve. It has two shot rings, a javelin runway, and a discus/hammer cage. Brentwood superstar junior Sophia Rivera found out early Friday morning about the schedule change, which had her throwing in two events at 8 a.m. The girls’ javelin and shot put were both scheduled for eight, but Rivera was able to get moved to the shot put preliminaries’ first flight before changing shoes and throwing in the javelin preliminaries second flight, then changing shoes again and going back to the shot put finals, and finally heading back for the javelin finals. The New Balance Nationals Indoor shot put national champion and indoor national leader with a U.S. best and Missouri record of 50-6.25, started out slow in the shot. After a foul, Rivera had 39 and 40-foot throws, getting her into the finals, but not by much. Brentwood Jr Sophia Rivera won the shot put in a US#7 47-3.5 and the javelin in a US#3 162. If the shot put prelims were a disappointment for Rivera, the javelin prelims were just the opposite. A first throw of 159 was a two-foot personal best, and on her second throw, Rivera launched the javelin 162 feet for another personal best and the U.S. #3 mark. The javelin preliminary results must have woke Rivera up because she returned to form for the shot put finals. On her first attempt, Rivera threw a 47’ bomb, 47-2.75 to be exact to put her in the lead. After a foul, Rivera had a final throw improvement of 47-3.5 toss, a U.S. #7 mark. Lutheran South’s Emily Eller finished second to fellow St. Louisan Rivera. Eller had a best throw of 43-5.25, while her season’s best of 43-10 is a U.S. #47 mark. It was the first of two great finishes for the Lady Crusaders throws crew. Lutheran South Sr Emily Eller was 2nd in the shot put with a 43-5.25. An exhausted Rivera returned to competition at 1 p.m. for the discus where she managed a best throw of 137’, good for a 7th-place finish. Eller’s teammate, senior CeCilya Johnson, is the reigning Class 3 discus champion with her 2014 mark of 142-6. Johnson threw for a personal record of 143-7 at the Festus Early Bird Meet. At KU, Johnson started with a foul, but followed with an 11-foot PR of 154-08. The mark tied her for seventh on the milesplit.com U.S. performance list and gave her the Relays victory. Lee’s Summit West freshman Makayla Kelby impressed with a 12-foot PR of 144-2 to place 4th in the event, a U.S. #33 mark. Lee’s Summit West Fr Makayla Kelby was 4th in the discus with a 144-02. On the boys side the Blue Springs senior twins of Carlos and Khalil Davis are looking to improve on their historic 2014 performances. Their 212’ and 197’ discus throws at the state meet were a state record and one of all-time bests in Missouri history. Those marks also made the pair two of the best in the country. At Kansas, the pair came away with season bests in both the discus and shot put, and faced off with one of the country’s best throwers in both events in Leavenworth, Kansas’ Willie Morrison. In the discus, all three started strong. Khalil Davis got off a 181’ throw on his first toss, his best of the day that put him third. Morrison also got his best throw on his first with a 189’ effort. Carlos Davis opened up with a 192’ mark that gave him the lead. On his third attempt, he improved to 194-07 to secure the win and a U.S. #2 mark. A third 190’ toss on his final attempt made it a great series for Wildcat senior. Fellow Blue Springs senior Marqus Andrews only got one fair throw in, but his 157-05 mark placed him 10th and gives the Wildcats three possible discus scorers at the state meet. Blue Springs Srs Carlos Davis (left) and Khalil Davis (right). In the shot put, Morrison came in with a season best of 68-9, putting him second nationally. He had three fair throws, all which were over 60’ and his best of the day came on his fourth attempt with a 64-11.50 to give him the win. Carlos Davis managed a best of 57-07.75, which put him third overall. Brother Khalil started slow with 49 and 51-foot tosses before a 56-02 mark on his fifth attempt, placing him fifth. Lutheran South senior Andrew Ryan took 10th with a mark of 51-06.5. In the javelin, Andale, Kansas junior Jeff Ast won with a mark of 201-09. Ast’s season best of 226-02 makes him 1st nationally, some 16’ feet ahead of the next best competitor. The Adidas Grand Prix’s 100-meter qualifying races were run Friday morning. Because it’s possible and saves time, the girls and boys races were held alternately. A girl’s section was run on the home stretch, then a boy’s section run on the backstretch, then back to the homestretch for another girls section, and so on. In the boys’ final section, Raymore-Peculiar junior soccer player Micah Beaver picked up the biggest win of his track career. Beaver ran a 10.84 100-meter dash to edge Leavenworth (Ks) sophomore Clifford Robinson by 7/100ths, securing a trip to the Dream 100 at the Adidas Grand Prix. Liberty North’s Jon Redmond was fourth in 11.01 while the wind was +1.7mph in the final section. Ray-Pec Jr Micah Beaver won the 100 to earn a berth in the Adidas Dream 100. The girls 100 included two of the best Missouri preps. UCLA signee Arglerne Annelus, a Grandview senior and multiple-time Missouri Class 3 state champ was in the field, as was Lutheran South senior and Mizzou signee Maya Cody. Shayna Yon, a senior from Colorado’s Cherokee Trail high school pulled to the lead and held on to win in 11.69 seconds in the race that had +1.5 mph wind. The time matched a previous season best which is tied for seventh on the milesplit.com performance database. Annelus was second in 11.77 which is tied for 41st on the US performance list. Bellevue West (Ne) junior Chloe Akin-Otiko was third in 11.91 while Maya Cody was fourth in 12.07. Lutheran South’s Sr Maya Cody (#3985), Bellevue West (Ne) Chloe Akin-Otiko (#1194), Cherokee Trail’s Shayna Yon (1722), and Anglerne Annelus in the 100-meter dash. The Kansas Relays doesn’t schedule an open 200 for high schoolers with all of the relay options, but there was some standout performances in the 400. Liberty freshman Kaitlyn Lewis was seventh in the event in 58.18, and anchored the Blue Jays 4×400 squad to a first-place finish in section four of five for a sixth-place overall finish in 4:02. In the boys 400, Raytown South junior Quincy Hall rolled to victory. Hall finished in 48.29 while Blue Springs senior Taysean Goodwin was third in 48.84. Hall returned to the track less than 2.5 hours later where he took third in the 300-meter hurdles in 38.38. Raytown South Jr Quincy Hall won the 400 in 48.29. The hurdles were especially successful races for Missouri athletes. Sedalia Smith-Cotton senior Mariona Ward won the girl’s 100-meter hurdles in 14.89, running into a slight breeze. In the 300-meter hurdles, out-of-stater Ashleigh Carr of Oakland-Craig won in 45.41 while Ward earned her second medal of the meet with a runner-up finish, clocking in at 46.05. 2014 Missouri Class 1 State champion in the 100 and 300-meter hurdles Emily Wedlock, a junior from Mound City was third in 46.16. Sedalia Smith-Cotton’s Mariona Ward won the 100 hurdles and was 2nd in the 300 hurdles. Mound City Jr Emily Medlock was 3rd in the 300 hurdles. In the boys 110-meter hurdles, Liberty North superstar senior Andrew Madison, the 2014 Missouri Class 3 110 and 300-meter hurdle champion, won in 14.35. Adrian senior Austin Corley took third in 14.64. In the 300 hurdles, it was Corley, the 2014 Class 2 state champion pulling away from the field down the homestretch. Corley won easily in 37.67, the 26th best time on the milesplit.com national performance list. Madison was second in 38.24, while his season best of 38.11 is tied for 49th nationally. Two and a half hours after his 400-meter victory, Raytown South’s Quincy Hall took the bronze in the 300 hurdles in 38.38. Liberty North’s Andrew Madison won the 110 hurdles, was 2nd in the 300 hurdles, and anchored the Eagles to victory in the 4×200. Adrian senior Austin Corley took third in 14.64 and won the 300 hurdles in 37.67, the US# 26th time. Friday’s track events kicked off at 8 a.m. with the girls’ 4×1600-meter relay. Blue Springs South senior and University of Arkansas signee Grace Klausen had the best leadoff leg and best leg overall with her 5:13 carry to give the Jaguars the lead. After the first leg, Lee’s Summit West was seven-seconds back and Raymore-Peculiar nine-seconds back. Blue Springs South appears to have kept the lead until the final leg. That’s when Ray-Pec’s Kami Tabor ran the second fastest leg of the race with a 5:16, putting Ray-Pec in the lead and giving them the victory in 21:40. Ray-Pec’s Jamie Wharton and Alie Gillespie ran the middle legs. South held on for second, 3-seconds back in 21:43.95. Lee’s Summit West was third in 21:53.63. It was at least the 11th straight win for a Missouri girls squad. Francis Howell set the meet record last year in 21:01, after a streak of five straight wins by Lee’s Summit West. That was preceded by Festus winning in 2008, while Lee’ s Summit North won three-straight from 2005-2007. 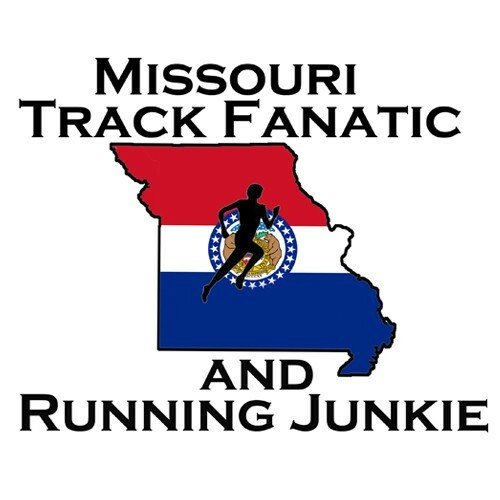 While Missouri teams went 1-3 in the girls 4×1600, Missouri boys squad were shut out of the gold, silver, and bronze in the event. Rockhurst was fourth in 18:26 while Rogers (Ar) won in 18:05. The next high school relay on the track was the 4×100. Anglerne Annelus anchored Grandview to victory, edging Blue Springs in a Missouri #1 48.37 to 48.68. Raytown South was third in 48.82, just 1/100th of a second ahead of Blue Springs South in fourth. In the boys’ race, the Grandview boys made it a school sweep. Grandview ran 42.63 to beat out Olathe-North (Ks) and their 42.84. The East St. Louis (Il) Flyers edged Staley high for the bronze medal by 1/100th, 43.02 to 43.03. Anglerne Annelus anchored Grandview to victory in the 4×100. The Grandview girls won the 4×100 relay. The Grandview boys made it a sweep in the 4×100 relay. The sprint medley relay was the first relay of Friday evening and Jesse Griffin’s Lee’s Summit West ladies were looking for their second straight title. Blue Springs south led on the third of four laps after two 200-meter legs and one 400-meter leg, while Lansing (Ks) and Lee’s Summit West trailed. With 200-meters to go, it was still a three-team race. Lansing and Lee’s Summit West had pulled just in front of Blue Springs South. Soon after though West’s Jana Shawver pulled out of lane one and into lane two and turned on the jets. West won in 4:12 while Lansing was second in 4:15 and Blue Springs South third in 4:17. Shawver, a freshman, clocked a 2:20 800-meter split to give the squad of herself, Nicole Kallenberger, Kayra Atkins, and Erin Sermons the victory. The relay cup trophies are given to all winning relay teams at the meet as well as an overall outstanding relay team at the meet for boys and girls. With the Sprint Medley Relay cup, Coach Griffin has now been a apart of 21 cup winning teams, either as a head coach or assistant coach at Raytown South, Lee’s Summit North, or Lee’s Summit West. Coach Jesse Griffen’s Lee’s Summit West girls won the sprint medley relay. Lee’s Summit West’s Nicole Kallenberger hands off to Kayra Atkins on their way to winning the sprint medley relay. The Lee’s Summit West girls celebrate their victory in the sprint medley relay. In the boys sprint medley relay, the East St. Louis Flyers held off Ames Ia. to take the victory in 3:38.48. Fort Osage was the highest finishing Missouri school, taking fifth in 3:41.15. The 4×200 immediately followed and the Blue Springs girls dominated. The team of Jenna Jacoby, Jessica Lawson, Gabrielle Hall, and Aliyah Lee won in 1:41.65, nearly two seconds ahead of Hazelwood Central. In the boys 4×200, Liberty North edged Raytown South for the title. Andrew Madison anchored the Eagles to a 1:28.30 clocking under the Rock Chalk Park lights. The Blue Springs girls won the 4×200 relay. Andrew Madison anchors Liberty North to victory in the 4×200 at Rock Chalk Park. The Liberty North boys were the 4×200 champions. Francis Howell sophomore sensation Maddie Leigh gave the Vikings the lead after the first leg of the 4×800, but it would not last. The homestretch of the final leg saw Blue Springs’ Sierra Spinler trying to chase down Green Mountain’s (Co.) Cammy Sargent. Spinler came close but ran out of room. Green Mountain held on to win in 9:36.07 while Blue Springs settled for second, 8/100ths back in 9:36.15. Green Mountain (Co) holds off Blue Springs for the 4×800 title. Ames (Ia.) improved upon their runner-up sprint medley relay finish with a victory in the 4×800. Ames started out with a 2:02 first leg and 2:04 second leg. However 1:54 and 1:55 closing legs made up lots of ground and gave them victory in 7:56. Omaha Creighton Prep was second in 7:58. After his 4:15 1600-meter race, Stephen Mugeche ran the fastest split of the 4×800 with a 1:54.32 to lead Blue Springs to a third-place finish in 8:03. The meet wrapped up with the 4×400 relays and it was the Blue Springs girls winning their second relay of the day. Aliyah Lee again anchored the Wildcats to victory, in 3:58. Linn-Marr (Ia.) was second in 3:59, while Liberty took seventh in 4:02. After taking the sprint medley relay title, the East St. Louis boys were looking for another relay champion cup trophy of the meet. The Flyers led the whole race, but had to hold off surging anchor Taysean Goodwin of Blue Springs to do it. Blue Springs coach Joe Cusack was overheard saying Goodwin split a 46-second leg. Goodwin came close, but East St. Louis held on to win by 11/100ths of a second in 3:20.84. Aaliyah Lee anchors the Blue Springs girls to victory in the 4×400 relay. The Blue Springs girls were 4×400 champions. East. St. Louis holds off Blue Springs for the 4×400 crown. The East St. Louis Flyers celebrate their 4×400 victory. The Blue Springs girls were awarded the outstanding relay team at the 2015 Kansas Relays, after winning two relays, and taking second in two others. Justin Hall, a Blue Springs junior, took 7th in the long jump with a mark of 22-3.5 with 2.8 wind. Olathe North (Ks.) junior Isaiah Simmons won with a jump of 23-2.5. On the girls side, Kelly McKee of St. James Academy (Ks.) won with an 18-3 best. Lincoln College Prep’s Tasjia Thomas was the top Missouri finisher with a jump of 17-8 with 2.4 mph wind. North Kansas City’s Nekiesha Bailey was fourth with a 17-6.75 mark. Blue Springs Sr. Jacob Peister won the triple jump in a US #12 mark of 48-5.5. In the girls triple jump, Carthage junior Kim Teed earned the victory. Carthage Jumps Coach Chuck Sailor was honored by the Missouri Track and Cross Country Coaches Association as a distinguished Coach in December, and his pupil’s feat showed off Sailor’s ability. After a first attempt 34’ jump, Teed got consistent, posting five 36’ jumps. Her second attempt of 36-3 put her into 2nd place and a fifth-round 36-11.75 gave her the victory. Lincoln College Prep’s Tasjia Thomas earned the silver medal with a 36-5.75 jump, to go along with her bronze medal in the long jump. Carthage’s Kim Teed captured the triple jump title with a jump of 36-11.75. Last year, Summit Christian Academy (Lee’s Summit) freshman Carlie Queen set the Class 2 state meet record of 5-7.75 in the high jump. This year, Queen has cleared 5-9 to tie her for 16th on the U.S. high school performance list. At the Relays, Queen cleared 5-8 to give her the victory while 2014 Class 4 state champion Nekiesha Bailey of North Kansas City was second, clearing 5-6. Four boys apparently cleared 6-8 to tie for first. Sedalia Smith-Cotton’s Chance Johnson cleared 6-4 to tie for seventh, though the results do not show attempts, seeming to confirm what was overheard at the meet that the results were accidently deleted from the tablet computers that were keeping track. Summit Christian So Carlie Queen won the high jump with a 5-8 clearance. In the girls’ pole vault, three girls cleared 11-11.75, including 2014 Class 4 runner-up Nicole Kallenberger of Lee’s Summit West, and 2014 Class 3 third-placer Morgan Griffiths of St. Charles West. However, Elliett Kulkin of Jenks (Ok) won the event with fewer misses, as Kallenberger finished second and Griffiths third. St. Charles West Sr Morgan Griffiths (left) took 3rd in the pole vault while Lee’s Summit West’s Nicole Kallenberger took 2nd. Jenks (Ok) Sr Tommy Dial won and almost tied his dad’s meet record of 17-5.25 in the pole vault. The boys’ pole vault featured one of the country’s best. Jenks (Ok) senior Tommy Dial entered the meet with the fifth best clearance in the country at 17-1. Dial cleared 17-00 to win the event for a second year in a row and thirty-five years after his father and coach won the event in a meet record 17-5.25. Joe Dial, the Oral Roberts University head coach won the Relays high school boys pole vault and set the record in 1980. Dial tried to break his dad’s record, but his three efforts at 17-05.50 came up short. Jackson High School junior Dakota Maddox was one of two to have a best clearance of 15-00, but he had to settle for third on misses. Quite a few former Missouri prep athletes competed at the Relays as a collegiate athletes and one even set a meet record. Kansas senior Lindsay Vollmer, the former Class 2 many time state champion for Penny High School in Hamilton, MO. and the 2013 NCAA heptathlon champion, captured the Relays heptathlon title and set the meet record. The record she broke was held by Liz Roerhig, the former Minnesota All-American who was a Mizzou volunteer assistant while training post-collegiately and is currently coaching at Columbia’s Battle High School. Vollmer scored 5767 points to edge Roerhig’s mark by 27 points. Vollmer also ran a leg on the 2nd place 4×400 squad, and placed 5th in the javelin with a 137-2. Kansas Sr Lindsay Vollmer won the Relays heptathlon with a meet record score of 5767. Memphis freshman and 2014 Kansas Relays 3200-meter champion for Francis Howell, Kristen Adams, placed third in the 10k in 38:01 for Coach Doug Clark, the Lexington, Mo. native and former SMSU and CMSU runner. Adams former Howell teammate Whitney Adams, a KU sophomore, placed 7th in the 400 in 55.15 as well as lead off KU’s runner-up 4×400 squad that finished in 3:45. Kansas runner and former Kirkwood star Hannah Richardson ran a 2:09.20 800-meters to place third, while Ladue grad and Colorado State freshman Kate White was 10th in the event in 2:16. Many-time Missouri Class 1 state champion for Princeton High, Blake Goodin took seventh in the 1500 in 4:02. Lindenwood Sr Lindsey Blackwell, a Texas native, took 2nd in the Hammer Throw with NCAA Division 2’s second best throw of 189-9. Former Wentzville Holt speedster Chris Campbell took 3rd in the 400-meters in 47.81. Memphis Fr and Francis Howell grad Kristen Adams took 3rd in the 10k. Kansas So Whitney Adams took 7th in the 400. Kansas’s Hannah Richardson ran 2:09 to take third in the 800. Lexington, Mo. native and former SMSU and CMSU runner Doug Clark coaches the University of Memphis distance squad. Warrensburg, Mo. native and former Northeast Missouri runner and Jefferson City High and Emporia State coach David Harris is the Nebraska cross country and distance coach. Eldon High School and Mizzou graduate and Olympic silver medalist Christian Cantwell claimed another downtown shot put competition against some of the world’s best Friday night. Cantwell’s winning mark was 70-06.5. Former Southern Boone HS and University of Central Missouri All-American Andy Gilmore won the college/open high jump with a 7-02.5 clearance. The mark could hold up to qualify Gilmore for another USATF Championship meet. 2012 Olympian and two-time NCAA 200-meter champion struggled to a 21.14 runner-up finish in the 200-meters at the Relays. His coach, Tom Lester, said Mitchell was fatigued and that lead to the slow time for the Nike athlete. Mitchell has represented the U.S. on several teams over the last five years, and is the only U.S. athlete to finish in the top-4 in the 200-meters at the USATF Outdoor Championships in three of the last four years. Maurice Mitchell took 2nd in the 200. 1600-meter race winners Stephanie Jenks and Matt Plowman earned Outstanding Performers of the Meet honors. Jenks set the meet record in the event by nine-seconds and earned the fastest time in the country with her 4:40 clocking. Plowman also set the meet record of 4:11.43 and clocked the U.S. #6 time nationally. After her 1600 victory and meet record, Stephanie Jenks was named the Relays Most Outstanding Performer. After his 1600 victory and meet record, Matt Plowman was named the meet’s Most Outstanding Performer. The track stadium and throws field at Rock Chalk Stadium is one of the best track and field facilities in the country. It is just the fifth IAAF Class I Certified facility in the U.S., and just the 105th in the world. It has a nine-lane track. Two horizontal jumps runways sit inside the track on the homestretch. Two pole vault runways are on the inside of the track’s backstretch as well as on the inside of each of the ends of the track. Javelin runways run on each end of the track. There are discus cages at both ends of the track and there are four shot put rings, two at each end of the infield. The throws field, 25-meters north of the track, has two shot put rings, a javelin runway, and a discus/hammer throwing cage. The adjacent soccer field that sits to the east provides a team camp area, as well as a place to warm up and cool down. A six-lane 133-meter warm up straightaway sits to the west of the track, behind the backstretch’s bleachers. The track has 7,000 permanent seats, with the ability to add 3,000 temporary seats. All but one section are bottom-only bleachers, thus don’t have seat backs. One whole section at the finish line has full chair-back seats for reserved seating. The track has a Beynon Sports Surfaces’ BSS 2000 system surface and a 7-foot lane around the 9th lane before the outside fencing, providing room for athletes, officials, and media to move around the track while staying off the competition lanes. A big video board stands about 15’ off the ground 10-15-meters outside the track’s second curve. Sadly, it’s not as big as the one at Memorial Stadium, that allowed for live video and results at the same time. The new board only provides one at a time. Also, it could only list the top eight finishers in a race, so in a race of nine, the display board can’t show all competitors times at the same time, and it didn’t show team names, just athletes. One other issue is that if you are behind the finish line, you can’t see any race times. The timing crews video boards at the finish and on the ground on the backstretch show a running clock, but that’s it. There is no other clock to read. One of the other best things about having the Relays or meets in general at the old Memorial stadium was the protection from the weather the underside of the stadium provided. The area under the seating at the stadium also provided a great place for teams to gather or camp out and relax before or after competition. One of the other great features of the Kansas Relays at Memorial Stadium was the many video cameras around the stadium to give multiple feeds. Thankfully, that hasn’t changed much. However, the finish line camera that sits 25-30 meters past the finish line was ground level and up against the fence. Which means it’s view was blocked whenever someone needed to walk from the finish area around the track’s curve or to the bullpen area, which sits just west of the tracks second curve in a temporary tent. Ideally, the straight-on finish camera should be raised, up off the ground and above any possible traffic. Otherwise, the camera situation looks good. There are camera stands in the seating areas of both the backstretch and homestretch. The building that sits three-stories tall between the soccer field and track complex is well done and has the design feel of the press box at Memorial stadium. The lower level houses the KU track team locker rooms as well as training rooms for sports medicine. The third floor houses timing and television broadcast rooms as well as the media workroom. The working pressroom is nice, but is not big enough to house media for the national championships. Temporary workspace would have to be provided in that case. The parking lot is big and Rock Chalk Drive, which sits 120-meters south of the stadium, provides extra parking, and a place for bus parking. However, if Rock Chalk Drive stays one-direction for parking, there is one road into the stadium and just two out. That means traffic jams. The stadium lighting is excellent; the stadium is very well lit at night. There don’t appear to be any holes of darkness, where the lighting doesn’t reach on the track. One issue with the great facility is that the University of Kansas does not own it. It is apparently a development of the City of Lawrence and a private investor, from whom the University rents it at a price tag of a million dollars a year for the next 30-plus years. Some group, either the school or the city have secured the 2016 NCAA Division I West Preliminary meet, however it’s unclear which entity would if at all, seek other big national events like the NCAA Championships or the USATF Championships. If the University doesn’t own the facility, they may not see a big enough benefit to do any work toward hosting national championship events since they may not directly benefit financially or otherwise from them. The city and the private investor may be interested in bidding for national championship events, but may not have the knowledge or manpower to host it themselves. Former Kansas Relays director Tim Weaver left the position about six or seven years ago to work in real estate in Kansas City. If he is still around, the city should reach out to him and see if he’s interested and available to lead the task of securing and hosting championships. Weaver has experience with USATF as he has been a team manager for numerous international USA Track teams. Overall the facility is great and the meet went well despite the crammed schedule Friday. Meet administration did the right thing in condensing the meet’s last two days in to just Friday. No one likes to sit in the pouring rain to watch track, or have it be delayed or cancelled, so the right decision was made. It did rain Saturday, hard for a period of time, confirming that the right moves were made at the meet.